For 3.5 million Rohingya Muslims of Arakan State of Burma, history has turned out to be an instrument to subject them to the worst human rights violations like denial of citizenship, a ban on marriage without government permission, severe restrictions of movement, religious persecution, extortion, land confiscation and restrictions on access to education etc. Médecins Sans Frontières (MSF), which works in northern Arakan State and has also operated in the camps for Rohingya refugees in Bangladesh, has described the Rohingya as one of the ten world populations in danger of extinction. However, turning the wheels of Rohingyas' history backward and distorting the records of Rohingyas' glorious past in the multicultural society Arakan which is traced back to the 7th century, the Burmese military regime and the majority of Rakhines of Arakan State brand the Rohingyas as the 'Bengali immigrants' alleging that 'In the time of the British government, it was that the British brought Bengalis and Indians of India (now Pakistan, India and Bangladesh) into the nation with various intentions. ....The British ruled Rakine State (Arakan) for 123 years from 1827 to 1948. During that period, Bengalis entered the nation en masse.' Ref: The New Light of Myanmar, a state-run news paper of the Burmese military regime, dated Jan 30, 2009. The anti-Rohingya camps brand the Rohingyas as Bengali immigrants because of their close affinity with the neighbouring people of Chittagong of Bangladesh linguistically, religiously, culturally and physically. Notably, Rohingyas share Indo-Aryan physical features of dark and pale skin like the people of Bangladesh and India because of being the descendants of the people of the Indo-Aryan stock. However, the focal point of the historical rivalries is whether the Rohingyas existed in ancient Arakan Kingdom before its annexation with the British colonial rule in 1827. Even though there is a tug-of-war between the Rohingyas and anti-Rohingya camps over many issues of the history of ancient Arakan, but at least there are few issues where there is an unequivocal consensus among the Rohingyas, the anti-Rohingya camps and the world historians. They unanimously agree that the names of many kings of the ancient Arakan before the British colonial rule, were 'Muslim' like (1) Solaiman Shah Narameikhla (1430-1434), (2) Ali Khan Meng Khari (1434-1459), (3) Kalima Shah Ba Saw Phyu (1459-1482), (4) Mathu Shah Doulya (1482-1492), ( 5) Mohammed Shah Ba Saw Nyo (1492-1493), (6) Nori Shah Ran Aung (1493-1494), (7) Sheikh Modullah Shah Salingathu (1494-1501), (8) Ili Shah Meng Raza (1501-1523), (9) Ilias Shah Kasabadi (1523-1525), (10) Jalal Shah Meng Saw Oo (1525), (11) Ali Shah Thatasa (1525-1531), (12) Salimshah (1608). 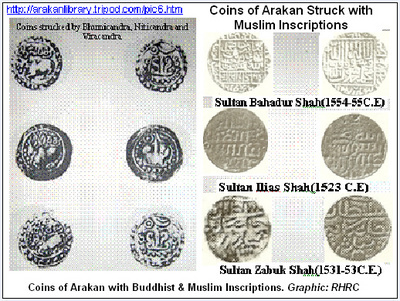 All the historians including the anti-Rohingya camps also unanimously agree that all those kings used coins with Muslim inscriptions like Kalima 'la-ilaha-illallah', 'Muhammedur Rasulullah' etc. This is irrefutable evidence that the Muslims existed in Arakan either as a ruler or as a predominant factor in ruling the ancient Arakan Kingdom. This is also an irrefutable evidence of the peaceful coexistence of all the people of Arakan irrespective of caste, creed or colour who have concentrated to defend the peace and prosperity of their motherland Arakan. So, it is quite illogical to raise a controversy as to whether those kings of Arakan were Muslims or simply used Muslim names and titles and coins under a tremendous Muslim influence. Dr Francis Buchanan, later known as Francis Hamilton or Francis Buchanan-Hamilton (15 February 1762 - 15 June 1892) was a Scottish physician who made significant contributions as a geographer, zoologist and botanist while living in India. From 1803 to 1804 he was surgeon to the Governor General of India Lord Wellesley in Calcutta. 'I shall now add three dialects, spoken in the Burma Empire, but evidently derived from the language of the Hindu nation. The first is that spoken by the Mohammedans, who have long settled in Arakan, and who call themselves Rooinga, or natives of Arakan. The second dialect is that spoken by the Hindus of Arakan. I procured it from a Brahmen and his attendants, who had been brought to Amarapura by the king’s eldest son, on his return from the conquest of Arakan. They call themselves Rossawn, and, for what reason I do not know, wanted to persuade me that theirs was the common language of Arakan. Both these tribes, by the real natives of Arakan, are called Kulaw Yakain, or stranger Arakan. The last dialect of the Hindustanee, which I shall mention, is that of a people called, by the Burmas, Aykobat, many of them are slaves at Amarapura. By one of them I was informed, that they had called themselves Banga; that formerly they had kings of their own; but that, in his father’s time, their kingdom had been overturned by the king of Munnypura, who carried away a great part of the inhabitants to his residence. When that was taken last by the Burmas, which was about fifteen years ago, this man was one of the many captives who were brought to Ava. Giving a record of the 'Rooinga' vocabulary, Dr Francis Buchanan mentioned 50 words spoken by the 'Rooinga' tribe by that time like: ( 1) Bel - Sun (2) Sawn - Moon (3) Tara - Stars (4) Kool - Earth (5) Pannæ - Water (6) Auin - Fire (7) Sheel - Stone (8) Bau - Wind (9) Jorail - Rain (10) Manush - Man (11) Meealaw - Woman (12) Gourapa - Child (13) Mata - Head (14) Gall -Mouth (15) Bahara - Arm (16) Hat - Hand (17) Ban - Leg (18) Pau - Foot (19) Zoomtroo - Beast (20) Paik - Bird (21) Maws - Fish (22) Goom - Good (23) Goom nay - Bad (24) Boddau - Great (25) Thuddee - Little (26) Botdean - Long (27) Banick - Short (28) Awg* - One (29) Doo - Two (30) Teen - Three (31) Tchair - Four (32) Pansoee - Five (33) Saw - Six (34) Sat - Seven (35) Awtoa - Eight (36) Nonaw - Nine (37) Dussoa - Ten (38) Kau - Eat (39) Karin - Drink (40) Layrow - Sleep (41) Pawkay Bayra - Walk (42) Boihow - Sit (43) Tcheilayto - Stand (44) Marim - Kill (45) Hoi - Yes (46) Etibar - No (47) Hayray - Here (48) Horay - There (49) Ouchalo - Above (50) Ayray - Below. Notably, except four words e.g. ; Ban, Thuddee, Tcheilayto and Etibar out of these 50 Rooinga words, all other 46 words are still commonly spoken by the Rohingyas of today's Arakan and the people of Chittagong alike some ones with a little change of accent, object and area. So, this is irrefutable evidence that the word 'Rohingya' has originated from 'Rooinga', the name of a tribe of the Muslims of the ancient Arakan. It did not spring up like a mushroom in 1950s. "The Rakhaing King was the patron of all religions and culture. Siddikh Khan Mosque was built by the Rakhaing King in 1430 AD. It is the first Mosque in all Burma. I suggest that UNESCO may please take due action to restore this oldest Myanmar Muslim heritage. .... (1) The Rohingya issue is a cultural and political issue. (2) The politicians recognize the Rohingyas. I am a disciple of Bogri Kra Hla Aung and Chairman Kyaw Zan Rhee. I worked with them in 1966-67. We have about fifty Muslim comrades with us in Bogri’s party. Both leaders told me that we have to give due rights and recognition to the Muslim Nationals. As their disciple I recognize and respect the Rohingyas. (3) Presidents U Shwe Tha, U Maung Sein Nyunt, U Padi Phru, U Kyaw Hlaing,Dr. Khin Maung, Bo- Mhu Htun Kyaw Oo, Red Comrade Oo Khin Maung, Khaing Ahnar Ni are the politicians and they all recognize the Rohingyas. I also met General Khaing Raza with Dr. Yunus at Dhaka in 1991. I would assume that General Khaing Raza also recognizes the Rohingyas. Same conclusion applies to Commander Saw Tun who was killed along with General Raza." History is a mirror which reflects the past of a nation and in many cases it guides a nation to the road of peace and prosperity. In order to achieve peace and prosperity, it is immensely necessary to take care of only the positive and constructive events of the history and to bury the dirty ones. Rivalries will beget rivalries and it will never solve the problem. This will simply poison the life of the people of Arakan not only for today but also for the future generations. So, in order to let peace prevail in Arakan and to restore communal harmony between two warring communities - the Rakhines and Rohingyas, it is extremely important to bury the course of historical rivalries and to initiate a politics of peace to create a society for all the people of Arakan which would be free from political oppression, economic exploitation and cultural slavery. There is nothing fake about this article. Ancient Arakan(current Rakhine)was a muticultural society. British Surgeon Francis Hamilton-Buchanan did do publication on the languages of Burma in 1799. Surgeon Francis Hamilton-Buchanan was a real man and not a made up mystical character. Rohingya people did exist well before British ruled part of Burma. At one point Arakan was a independent country and was ruled by the Rohingya Muslims themselves. I have seen a clear picture of an ancient coin from 1500s which confirms this. It's laughable when fascist Myanmar/Burma government and anti-Muslim Buddhists deny Rohingya existence and insist that they are 'illegal Bangali migrant'. In the past, Myanamr/Burma government acknowledged Rohingya as such people and one of the natives of the country. Old government documents confirms this. What the anti-Muslims in Myanmar/Burma and their government need to know is that Bangladeshies are not desperate to live in a country where Muslims have no rights, are prosecuted and have been murdered since 2012. Any wonder Rohingya are fleeing from Myanmar/Burma in thousands. Bangladesh's economy is doing well and no minorities are prosecuted by government. Bangalies are not stupid to leave this stability for a country which has no future for Muslims. Until 2012, Myanmar/Burma was under sanction. Until last year I knew nothing about Rohingya Muslims. I have come across pictures, footages and victims' statements on the killings and mass rapes of Rohingya and carried out by Myanmar army and their Buddhist supporters. I needed to do some research on vulnerable Rohingya to understand their situation. I am still continuing the research. Meanwhile, I have been doing my bit for the humanity by making awareness of Rohingya Genocide and encouraging people to boycott that evil country. There is nothing fake about this article. It's backed up by references.